What kind of build plate are you using? Any time. I love the glass! I clean it with isopropyl alcohol before each print and it's been amazing. Let me know if you have any questions. Just one more question, how did you get the carbon fiber pattern? It looks sick. Thanks! It's actually a thin fabric I had. It looked boring with the metal under the glass so I cut a square piece and put it under the glass. I haven't had a single issue and it looks miles better. Interested in building this, but I'm curious - do you have to handwire it with this design? Or could I just throw a PCB in it, solder the switches, and call it a day? It might...but it wasn't intended to accommodate one. The top plate was designed really thick so there is no flex but the pins should be low enough to reach a pcb. Im sure you'd need to cut off the towers in the lower portion and maybe file here or there. Interested to see if you give it a go. Awesome! I’m excited to see your build. Simplicity. Costar stabilizers are easy to adjust and maintain if you want to lube them. Also, I had trouble with mx style stabilizers on my Drevo Calibur. A few broke when I was switching keys. The Costars are a bit more fiddly to take on and off but the simplicy of them drew me in. I just finished the first of two planned builds and the only issue I have is the stabilizers. When I press the space bar, it doesn't come back up. I'll have to dig into it some more to try and figure out what's happening. My current theory is that I might have to adjust the vertical uprights on the plate mount stab parts. I'm more experienced with the Cherry type. Easy fix. These things are adjusble. You need to ever so gently bend the stabilizer rod inward. Using your thumbs, place them on the middle hump with the left and right angles facing at you. Gently give it the slightests of bends and it will work great. You can adjust how much tension the stabilizer has this way. fair enough ill stick with the costar stablisers then . I have found a few errors with your design nothing major so I have repaired them and I have changed your screw holes to use m3 threaded inserts and 10mm M3 screws to make it more durable and less likely to strip the screw holes when assembling it. I have also designed a full set of keys for it which I have been printing at 0.03 layer hight. its been taking 1 hour per key. I will upload all the files once I have completed it. Oh awesome. I just tried to make things as simple and cheap as possible. The idea of inserts and m3 screws sounds great though. I see that some of your images show the SiCK-68 logo as recessed into the print but the files included in the download have the logo raised. Would it be possible to include the top left piece with the recessed logo, along with the file to print just the logo? Oh you are quick! Thanks. I did not expect to see another awesome keyboard design from you before I've been able to complete your earlier one! I'm going to have to make this one as well, even though the last thing I need is another keyboard! Could you tell us what brand filament you used for the granite effect on the top pieces, and if you had any issues printing with it? I didn't even know that type of filament existed but a search turns up several options. I enjoyed the first one so much I needed to make a new one for the office asap! haha. It's actually REALLY good filament. Prints easy with no modifications from standard PLA and it hides a lot of imperfections and layer lines. Its a bit smoother and looks great. Highly recommend. This is awesome! I would love to incorporate this into a future project. Can you also upload your teensy firmware? Thanks! I'll work on getting those over to you guys. I need to add a little write up on how to do it using EasyAVR. How do you like this one vs your Tada68? Oh awesome. Im honestly not sure if it would just mount up. I've only ever had Teensies. Ill work on getting you guys the files. It looks like the mount is just slightly too small to fit the Pro Micro. My calipers measure the Pro Micro at ~18.7mm across compared to the Teensy's 17.8mm. The PCB thickness looks about the same, so the microUSB port looks to be accessible fine too, just the hole is a bit bigger for the mini. https://i.imgur.com/nQrJNsr.jpg Not sure you can tell from the picture, but it just barely doesn't fit. Also I realized a standard Pro Micro only exposes 17 pins which isn't enough for the keyboard. And one of them is right next to the front edge so that barely accessible. So that's going to be annoying. 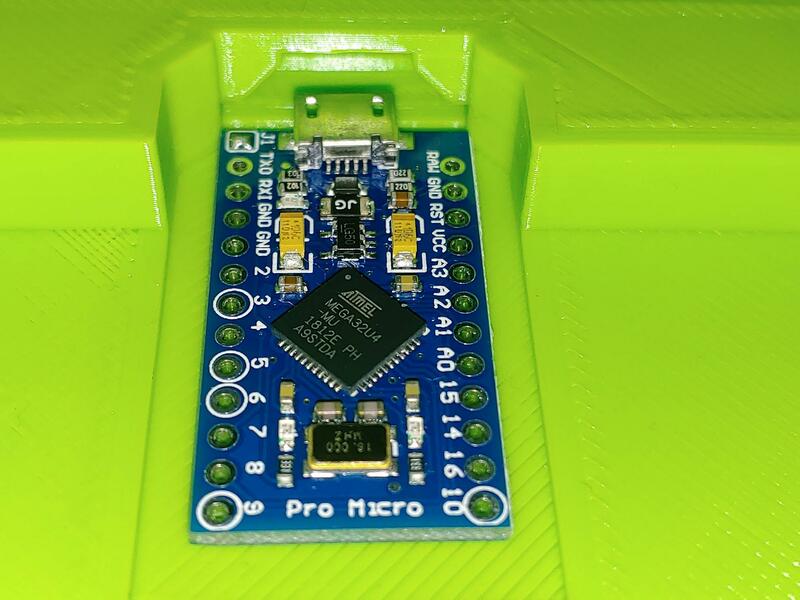 editying for more stuff: one of my favorites, RobotDyn's Pro Micro clone adds a few more pins and happens to fit in the slot fine, but I have the pinned version and don't want to bother removing them. And their clones are pricey enough that I'd rather just get a Teensy. Also, the Elite-C boards looks awesome. Additional pins + USB C.
Love that color! What color did you make the top? I'm doing the same Ziro marble for the top. Though I've also got a bright yellow I might do. I'll order some Teensys from China. So now it's the waiting game. Would love a tutorial . I bought all the parts including the teensy expecting it to be able to just upload your code and it be done but I've checked the link you posted on here and theres nothing on there so I had a look around on google to see if I could find out how Im supose to program it and there doesn't seem to be much about how to do it. I've played around with EasyAVR but don't have a clue on what to even do with it. surely I'm not going to have to program this myself by hand ?? Ok I found the issue, in the .py doc, please edit lines 23,24,25 to have "SiCK-68" instead of "TADA68v2". Added a screenshot for reference. Also, updated the file within the downloads folder. I have updated the instructions to create a new profile instead of opening the included .json. You should still update the lines above or just replace everything with the new files I have added to the files section. I created a fresh virtual machine to test my instructions on a fresh slate and was able to successfully create a .hex following the institutions line by line. Should be good to go. erm the new ''How to program the SiCK-68.docx'' has nothing in it haha its just an empty word docment now. Fixed. Also, added the text into the description on the main page in it's own section on the bottom. I had just bumbled through setting up the firmware for your Tada68 the other day. It did take a while and several websites to get it figured out, so kudos for adding the info to this project. I wanted to mention that one of the keys you can assign will put the Teensy in bootloader mode, so you don't have to keep the back panels off to access the reboot button. I've currently got mine set as layer one, function key + escape. I'm glad it's around and has a chance to be helpful because like you said, the info was a bit scattered. Yes! The boot key is a must. I think otherwise you get an error in EasyAVR. With that said, one of my Teensys recognizes the button, but my latest does not. Being a cheap replica, I can't be mad about it. It is what it is and I dont change things around too often plus I dont mind popping off a few screws to get to the teensy itself to press it. That would make cents :) (Pun intended, sorry) I'm an Architecture student so I love the number pad for many reasons :). It's a wonderful design. Well done. Out of curiosity, did you ever think about making low profile Cherry MX keycaps? LOL. I gotta check the price on those. Otherwise, I'd LOVE to experiment with em.